Home - Top Stories - US Debt Crisis: How Bad for the US Dollar? 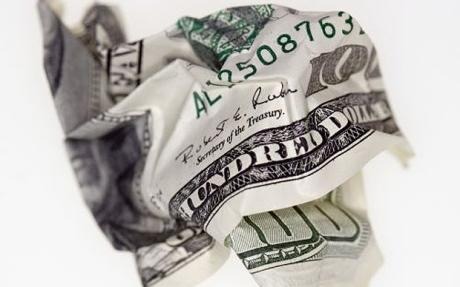 US Debt Crisis: How Bad for the US Dollar? The gridlocked negotiations between US lawmakers on raising the US debt ceiling and amending US fiscal policy have caused the US currency to lose about 4% of its value in a month. The reigning king of the foreign exchange market is losing its supremacy. The dollar, already eroded by the massive successive injections of liquidity into the markets by the US Federal Reserve is crumbling at full speed. Faith in the greenback is low as the threat of the United States defaulting on it obligations nears aided by the failure of Democrats and Republicans to agree on a compromise to raise the debt ceiling and curb federal spending. Even if the financial world does not seem to believe in the prospect of a bankrupt Uncle Sam – the consequences for the global economy would be “very, very, very serious,” in the words of Christine Lagarde, an IMF official. Concerns are growing as the major rating agencies, Moody’s and Standard and Poor’s have been threatening to downgrade US long-term debt from its current status of AAA – the highest rating possible. The other major currencies are gently clawing their way up in value against the US dollar. This rise is less obvious with regards to EUR/USD since the euro, too, is currently weakened by its own sovereign debt issues. “The Greek issue is far from being over, the German finance minister even admitted today that Europe will have to meet again to resolve the EU crisis. This is something that weighs on the euro,” Andrea Tueni, an analyst at Saxo Bank, remarked. “Right now, the Greek crisis is counterbalancing the American crisis, so EUR/USD remains relatively stable. Without the Greek crisis, the euro could move above $1.45 and even reach $1.47,” Tueni predicted. But for other major currencies, the dollar’s decline is quite obvious; especially for so-called “safe haven” currencies such as the Japanese yen and Swiss franc. Japan is alarmed at the yen’s current value: the US dollar is currently worth under 78 yen. In Switzerland, the situation is unprecedented: the Swiss franc is at the highest level in its history against the dollar, which fell to 0.7996 Swiss francs on Wednesday. The inflation of such currencies directly threatens the economies concerned, particularly for exporters. For example, slower economic growth is expected in Switzerland over the coming months. The prospect of Swiss GDP growth for 2011 was downwardly revised by the Swiss Department of Finance to 1.5% from 1.9% which had been previously expected.